The Creative Hitz WP380 Wireless Bluetooth NFC headphones feature advanced Bluetooth 3.0 technology, to ensure improved connectivity and easy pairing of mobile devices. With these Creative Bluetooth Headphones, you can enjoy your favourite tracks and receive calls on your mobile. A stylish pair of black headphones with a soft-touch rubberised finish, lets you put them on and enjoy the freedom of movement as you listen to your music. 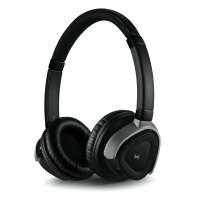 The Creative Hitz Headphones come with Bluetooth and built-in NFC (Near Field Communication), allowing them to be used with a huge range of mobile devices. 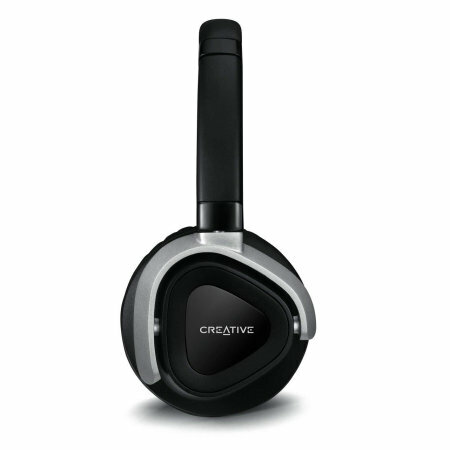 The Creative Hitz WP380 Wireless Bluetooth NFC headphones have been designed to perfectly blend form and function. The design includes on-ear playback functions, which allow you to play/pause your favourite tracks as well as adjusting the volume for greater control of your music experience. The increased ear cup foam density of the Creative headphones not only enhance user comfort, but the headphones' precise fitting also helps shut out external noise for extraordinary clarity and hard driving bass. The stylish headband is padded so that it provides a comfortable fit and can be easily adjusted to suit all head sizes. Designed with high-definition aptX and AAC audio, the Creative Hitz WP380 Wireless Bluetooth NFC headphones offers immersive stereo sound and superb audio quality. Additionally, the inclusion of digital sound enhancement and volume control mean that you can listen to your music distortion-free as loud as you could possibly enjoy. With an impressive battery life, the Creative Hitz Headphones will keep the music playing all night. Offering 12 hours of music playback and 14 hours of talk time, the Creative Headphones are sure to be ready whenever and wherever the moment takes you. Don't just settle for one, connect to up to two devices with the Creative Headphones, allowing you to easily switch between devices. So whether you have a work and personal phone or you're listening to your music and your phone goes off, you'll never be out of the loop thanks to the multipoint technology in the Creative Hitz Headphones. The headphones also come with an audio cable, which allows you to connect the headphones to your mobile device through a cable, allowing you to still listen to your music without pairing to your device through Bluetooth. It also means that the headphones are compatible with devices which feature an audio port and don't feature Bluetooth technology.